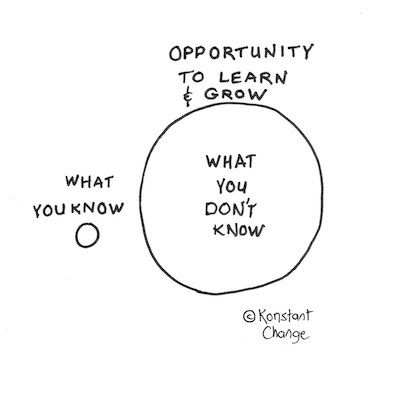 Cultivating a culture of curiosity in the workplace requires two active participants; the employer and the employee. Let’s start with you, the potential curiosity-seeker. Review the genuine interests you have outside of work. 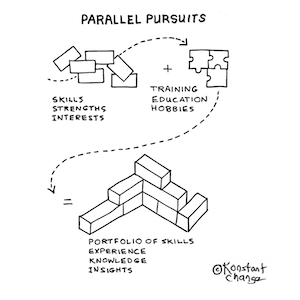 You can consider these parallel pursuits. Hobbies, freelance work, playing music, or taking a class all represent doing something on the side beyond your main job. If you are an “on the side” kind of person, you are cultivating brain neuron activity that deepens your capacity to learn. Neuroscience research (G. Raisman 1969) states when you explore areas beyond your current knowledge base, your brain opens up new pathways for learning. Sally Albright, Meg Ryan’s character from the romantic comedy When Harry Met Sally, liked to order things on the side with her meal. Items like salad dressing or whipped cream were examples. When applied to today’s work environment, developing an “on the side” strategy is a power play in the workplace. Similar to Sally’s habit of enhancing her main meal, pursuing side projects will help you cultivate creativity, growth and happiness. Futhermore, this keeps you relevant in the workplace. Activities pursued in parallel to your day job strengthen your skill set and provide insurance against career stagnation or worse, downsizing. The great thing about this strategy? You can focus on what interests you! Chelsea Behrens, career advocate and founder of Leading with Authenticity Summit and Rise to the Occasion, explains importance of pursuing interests. People benefit by exploring opportunities that are true to themselves. Side projects form a viable option to do this. While there may be a correlation between your work and your downtime pursuit, it’s not a necessary requirement. If you love the topic, it will make a positive impact on your professional life. Side interests create an environment for exploration and risk-taking outside of work. This grants you permission to envision the professional life you want. Rather than committing to the constraints of a one-size-fits-all job. There is higher demand (and less supply) for productive employees. Companies are under pressure to create relevant workforces capable of building the future workplace. Employees need to build products, solve business problems, and create customer experiences, while anticipating what’s next. Alexandra Levit, editor of Chief Learning Officer, explains these attitudes in her article about the necessity for learning agility. The future of work depends on it. The important side of this position, however, is how employers enable workers, giving them tools to develop learning agility. A culture of learning is a positive force. As a result, cultivating a curious brain will enrich team engagement, encouraging people to grow rather than stagnate in their roles. We’ve all heard the phrase, “this is the way we have always done it.” This is the enemy of innovation and a culture of curiosity. Even though it may be easier to stay the course, management and teams must move beyond the comfort zone of familiar project efficiency. Companies are well advised to foster a curiosity culture by rewarding the behavior geared to innovation and invention. For example, failure and risk may accompany experimentation or trying something new. The famous Google policy of letting employees use 20% of their time to pursue projects of their own (that will benefit Google) is an example. Another example is an individual’s interest in a different role outside of their current department. Consider helping the employee shadow other workers. Or, help them to learn new skills to advance to a different department, demonstrating a commitment to continued learning. Leadership must be willing to let go of repeat performance expectations requiring employees to stay in the same role. Highly-valued employees must be supported as they develop their talents to move to another role, department, or division. What’s Next in the Culture of Curiosity Quest? In summary, I mentioned it takes two to create a culture of curiosity in the workplace. The employer and you. The organization will benefit by encouraging and cultivating curiosity. This curiosity habit, however, can take additional time in a project meeting, and it can get messy. Yet the results are attractive to the bottom line of innovation-seeking organizations. Above all, take a risk by following your curiosity to see where it takes you.